1 : 1625000 Morton, A. C., engineer Bowen & Co.
A chart of the sea coast of New Foundland, New Scotland, New England, New York, New Jersey, with Virginia and Maryland. A map of ye English Empire in ye continent of America: viz Virginia, Maryland, Carolina, New York, New Iarsey, New England, Pennsilvania / W. Binneman sculpsit. A general map of the northern British colonies in America: which comprehends the province of Quebec, the government of Newfoundland, Nova-Scotia, New-England and New-York / from the maps published by the Admiralty and Board of Trade, regulated by the astronomic and trigonometric observations of Major Holland, and corrected from Governor Pownall's late map 1776. A General Map of the Northern British Colonies in America. 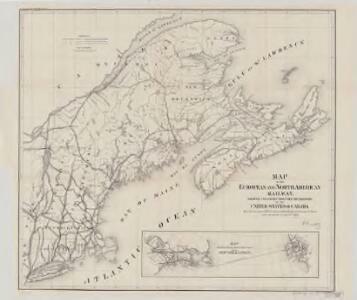 (East sheet) Map of the Provinces of Upper & Lower Canada with parts of the United States of America &c.
A New and correct map of the British colonies in North America comprehending eastern Canada with the province of Quebec, New Brunswick, Nova Scotia, and the Government of Newfoundland: with the adjacent states of New England, Vermont, New York, Pennsylvania and New Jersey. British colonies North America, New England. Map of the Seat of War in North America. 1 : 11000000 Fenner, Rest. Central Vt. RR. excursion routes. Map of the United States of North America / compiled from the latest and most authentic information by David H. Vance ; engraved by J.H. Young. Northern section of the United States, including Canada &c. / by John Melish, 1816; grav. af. C. F. Himberg. The coast of Nova Scotia, New England, New-York, Jersey, the Gulph and River of St. Lawrence, the islands of Newfoundland, Cape Breton, St. John, Antecosty, Sable, &c., and soundings thereof ... / by Jos. F.W. Des Barres Esqr., MDCCLXVIII. The coast of Nova Scotia, New England, New-York, Jersey, the Gulph and River of St. Lawrence, the islands of Newfoundland, Cape Breton, St. John, Antecosty, Sable, &c, and soundings thereof ... / by Jos. F.W. Des Barres Esqr., MDCCLXXVII. 1 : 1457000 Whittle, J.
Map of the seat of war in North America / J. Melish del. ; H. S. Tanner dirext. 1 : 7300000 Lucas, Fielding Jr.